A new edition of RB209, to be re-named the AHDB Nutrient Management Guide, will be launched in May. This document, regarded with affection by some but with fear by others, has a history going back to the 1st edition in 1973. The current 8th edition was published in 2010. Revised editions have appeared at around six year intervals due to the efforts of the most experienced researchers and agronomists with access to the latest trials data. Every edition of RB209 has been a compendium of their experience and knowledge representing the best nutrient management guidance at the time. The new edition will be no different. Some of the changes made for the new edition have been discussed and made public (see the video). On the arable side, one of these is the re-introduction of a yield adjustment for recommended nitrogen rates for cereals. Nitrogen rates were adjusted for wheat yield up to the 6th edition but since then percentage nitrogen in grain has been used as an indirect method of adjustment. However, the adjustment must be made with care and with realistic expectations. It reflects an effect of yield on the amount of nitrogen needed, not the other way around. In other words, just applying more nitrogen will not turn a 9 t/ha crop into a 12 t/ha crop. However, more nitrogen might be needed to support the 12 t/ha crop. The key question is how to get a high yielding crop, or really a history of high yielding crops, before starting to apply the yield correction. This is one of those questions that is hard for a philosopher but much easier for a practical person. Most growers will have a feel for the yield potential of their land and will know if it is capable of supporting high yields. A deep soil that doesn’t drought badly is a good start. Then all the possible restrictions on yield must be identified and dealt with where necessary. Variety, drilling date, cultivations, sulphur and micronutrient use and spray programme all should be checked and optimised. The aim must be to change the shape of the nitrogen response curve as shown in the diagram. National average wheat yield is around 9 t/ha and the average fertiliser nitrogen is 190 kg N/ha. The black line shows a typical response curve based on these numbers. If nothing else is done, applying more nitrogen in this situation will just waste money without increasing yield. 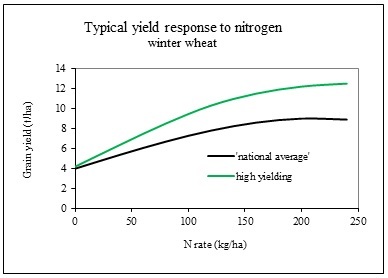 However, if the response curve can be changed to the green line by removing restrictions on yield, more grain will be produced for every kilogramme of nitrogen applied and there will be an increase in optimum nitrogen rate. This is the situation where the yield adjustment in RB209 can be used. There will be other changes in the new edition of RB209 though the general structure should look familiar to those who have used the current one. As applying the optimum rate of nitrogen typically doubles the yield of non-legume crops, it could be argued that RB209 is the most important tool for a farmer or adviser. Hopefully, the new edition will be widely used – every farm office should have a copy.